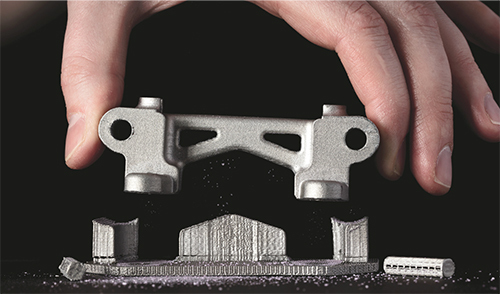 Described as “the first office-friendly metal 3D printing system for rapid prototyping,” DM Studio is a complete platform, including both a printer and microwave-enhanced sintering furnace that, together, deliver complex geometries of metal 3D printed parts in an engineer’s office or on the shop floor. The DM Studio printer extrudes bound metal rods, similar to FDM printers, which eliminates safety and facility requirements associated with traditional metal 3D printing, while enabling new features such as closed-cell infill for lightweight strength. It reportedly can produce near-net-shape metal parts, delivering the resolution and accuracy needed for functional prototyping. Sophisticated software constructs print and sinter plans for every build and material—automatically generating supports and control parameters to ensure a seamless experience from printing through sintering, according to company officials, without the need for dedicated operators. The system can print as much as 24 cu. in. per day, and maximum resolution is 50um.